Income here refers to total income from all sources including employment income, income from government sources, pension income, investment income and any other money income received during the calendar year 2005 by persons 15 years of age and over. *Low income before tax cut-offs (LICOs) – Income levels at which families or persons not in economic families are expected to spend 20 percentage points more than average of their before tax income on food, shelter and clothing. Economic families in the Yukon Territory, Northwest Territories and Nunavut and on Indian reserves were excluded as the low income cut-offs are based on certain expenditure- income patterns which are not available from survey data for the entire population. **Census metropolitan areas (CMA) are formed by one or more adjacent municipalities centred on area (known as the urban core). A Census metropolitan area (CMA) must have a total population of at least 100,000 of which 50,000 or more must live in the urban core. Urban non- Census metropolitan areas (non-CMA) are smaller urban areas with a population 100,000. 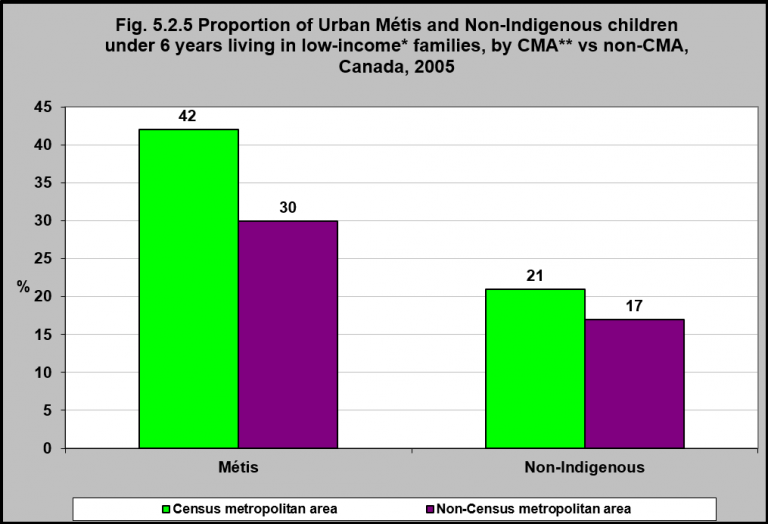 In 2005, 42% of urban Métis children under 6 living in census metropolitan areas (CMAs) were living in low-income families compared to 30% of urban Métis children living in non-CMA areas. The proportion of Métis children living in CMAs who were living in low-income families was twice that of non-Indigenous children living in CMAs (42% vs 21%).